Springtime is a glorious time in Grey Bruce! The flourish of colour that returns to our landscape (replacing the whiteouts of winter) is a sure sign of new beginnings and growth. Your Community Foundation is very busy these days with promising starts and kick-offs that bode well for an auspicious year ahead. 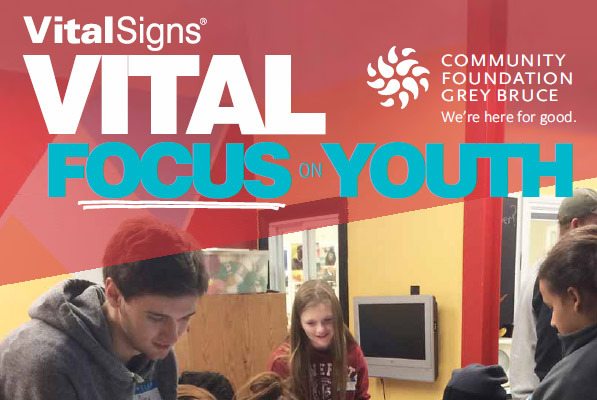 On April 12, we launch our new Vital Focus on Youth report, with a day of programs and conversations with young people. We’ll be offering a workshop for youth on developing a personal brand, led by our generous sponsor RBC Future Launch; followed by a keynote from inspirational speaker and marketer, Erin Bury; wrapping up with a panel discussion including some of our most inspiring local entrepreneurs. All this leads up to an exciting evening with Arlene Dickinson who will talk about youth and entrepreneurship, women and business, and community philanthropy. You will find all the information on this banner day and how to get tickets on our homepage. You’ll also be able to download our Vital Focus report after April 12. In March, we said goodbye to our staff member, Brenda O’Neill, who accepted a new position with the Owen Sound Hospital Foundation. Brenda has been with us for almost three years. On departing Brenda said: “It’s been a privilege and I hope I was able, in some small way, to contribute to strengthening awareness and understanding of how the Community Foundation serves to enhance Grey Bruce.” We thank Brenda for her great service and wish her continued success in her new job. In April, we welcome Sarah Haefling to the position of Community Outreach Officer. Sarah has just concluded a post-degree program in Marketing and has a degree in Business Administration with a specialization in Finance from Western University in London. Sarah brings lots of experience and fresh marketing perspective to the Foundation. I know that you will enjoy welcoming her to our Foundation family. On June 4, 2019, our Foundation celebrates its 25th birthday! We have grown and flourished since we were established by forward-thinking community leaders in 1994. Over the year ahead, we plan on celebrating our history while looking forward to what the next 25 years holds. I look forward to sharing some anniversary plans with you in the months ahead.